Broadcasting The Big Dig in it's first semester (Spring 2010) in the old KSCR station after training with DJ Kat Bouza on her show, Chocolate Covered Snack Cake. 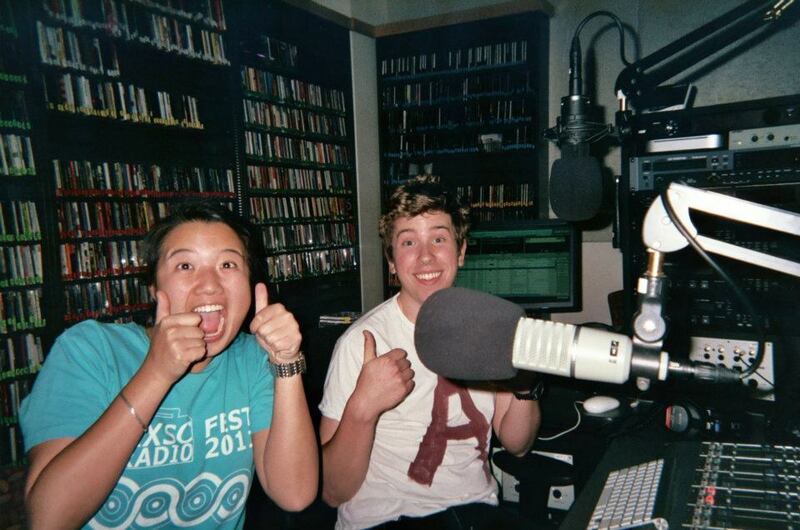 Favorite memory of KXSC: "First and foremost is how I found the station. I was walking down Trousdale and I heard music coming from a speaker above the sketchiest, unmarked door. I walked in, and I immediately joined the station. The second is the first KSCRFest, which was how I met everyone in the radio station, and got all my interning hours. The third is my last KXSCFest and my final year at the station as GM. The group effort we always put in to make the station succeed and feel like a family has stayed with me even now." 2011 Spring: Karl Nickenig (GM 2010-2011) and Alex Yen (Assistant GM 2010-2011), as she was being trained to be GM. How has KXSC shaped your career? : "Two ways. I didn't go into radio or the music industry, but without KXSC, I think my life and career would have gone in a very different, less rewarding direction. When I was at KXSC, almost every staff position I had entailed a component of mentoring, teaching, and helping people feel a part of the station. When I chose to go into a PhD program, I knew my life goal was to devote myself to teaching and mentoring. KXSC gave me so many opportunities to do this and most of all, helped give me confidence that I was good at this (I was VERY shy when I started undergrad)! Teaching and mentoring, but most of all, providing mentorship and support even after graduation/a class/one interaction, this duty and purpose I possess now owes itself completely to the radio station. The other way in which KXSC shaped me relates to the way in which a group of us from so many different majors and backgrounds come together and become a group. USC has always prided itself on its interdisciplinary approach, and in KXSC, I felt like that was enacted in the best way. My close friends there were in music industry, engineering, english, comm, philosophy, just to name a few. The station cemented in me that creativity and growth comes from when you look beyond your own expertise and partner with other inspiring, excited individuals who want to make change. Even now as I seek a career in academia, I see myself always crossing the imaginary divides between disciplines and encouraging my engineering or business students to bring this particular knowledge in when they are writing in a humanities class. It's all about the interdisciplinary and partnering together to be more creative and grow." A pit stop at Big Bend with KXSC staffers (left to right: Samantha Hampar, Candice Aman, Sachi Kobayashi, and Alex Yen) in Spring 2012 when KXSC road-tripped to South by Southwest in Austin, Texas. (photo courtesy of Sachi Kobayashi).